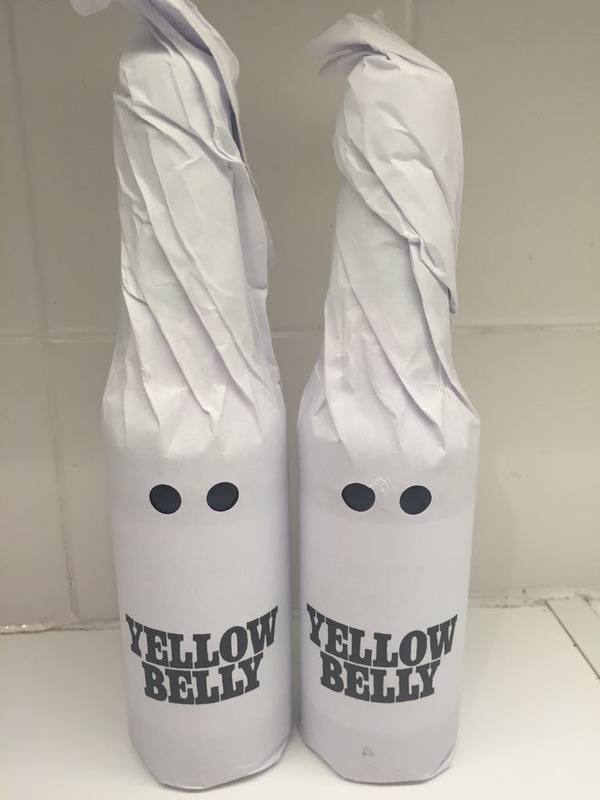 The beer...Yellow Belly....a collaboration between the Swedish brewery Omnipollo and Buxton Brewery a big time small time brewery in the UK. This was originally made as part of the Rainbow project in 2014 where a number of brewery's get drawn out of a hat from the UK and paired with foreign brewery.. They are then given a colour - yellow in this case - to base their creation on. Yellow Belly was born from this collaboration a few years back but was so popular it became a regular. 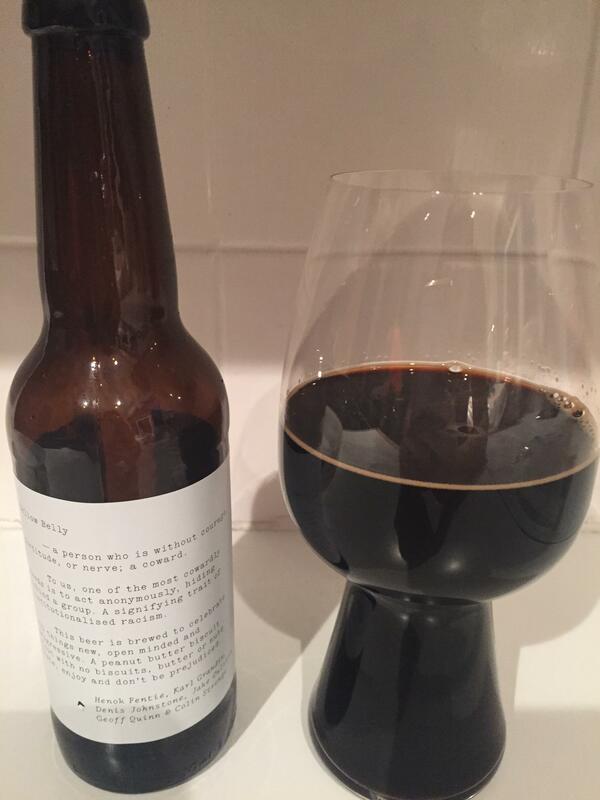 It was such a success that the two brewery's made a second YB called Yellow Belly Sundae in 2015. Yellow Belly is so hard to get hold of as it sells out so quick that I almost feel honoured to have managed to get some. It's so popular distributors put a cap of two bottles per person on sales. The bottle itself comes wrapped in white paper similar to that of the KKK.This is a clever play on the name and sticks it to those who choose to discriminate. The meaning of Yellow Belly - a person who is without courage, fortitude, or nerve; a coward. Under the wrapping paper is a label which gives the definition along with a longer explanation. The beer is an 11% peanut butter and biscuit imperial stout, except it has no peanut butter of biscuits in it. I must say when I heard this it sounded amazing but I was apprehensive to how noticeable the peanut element would be. I have drunk both of mine now and they pour beautifully, very dark, thick looking and has a dark brown thin head. Next is the part that blew my mind, a good swirl and sniff ignited my sense of smell with intense notes of a peanuts, milk chocolate and coffee. The Milk Chocolate was the standout note but was backed up by the peanut. It's very noticeable and very pleasant, I could almost just sniff the beer. I was concerned the beer itself was not going to taste as good. On the palate it was thick and milky, probably one of thickest I have had and it felt like an amazingly slick syrup. The taste didn't let me down, all the same scents came alive on the taste buds and made it a magical beer to drink...sweet, desert like and beery - a pure indulgent pleasure to drink. I loved this beer so much I am going to hunt down some more ASAP. I also need to try and find the Sundae version because I have heard that it is even better.